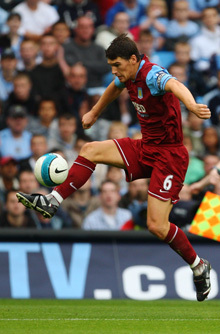 Will Gareth Barry replace Frank Lampard at Chelsea? Itâ€™s been quite a year for Gareth Barry, heâ€™s gone from international occasional to Englandâ€™s most consistent performer and now there are rumours that Chelsea are preparing a Â£15m bid to bring him to the Bridge. It feels like heâ€™s been around for ages and yesterday Barry became the youngest player to reach 300 Premier League games â€“ ironically overtaking the man he could replace in the Chelsea team, Frank Lampard. Lampard also hit form at the weekend but with a lucrative contract still unsigned, his future at Chelsea remains clouded with Barcelona apparently waiting in the wings come January. Martin Oâ€™Neil has obviously distanced the club from speculation but could Chelseaâ€™s supposed interest mean that Lampardâ€™s days are numbered and would Barry be the best replacement? Surely there’s room for both a Chelsea? Barry sits deep, Lampard goes forward and does what he does. Seems simple to me… but what do I know?